GDPR 365 - What is the GDPR? Through our partnership with GDPR365 we are able supply the specialist expertise and management tools to ensure that you become GDPR ready and compliant. Contact us now for more information or click on the link below to start the registration process. Individuals (or data subjects) have significant new rights, such as the right to be forgotten. Consent will be harder to obtain and can be withdrawn at any time. Organisations will become responsible for data security, and must report breaches. Privacy notices will need to contain specific disclosures. Transfers of data to organisation’s outside of the EU will incur specific requirements. The new regulation will apply to organisations outside the EU who collect and process personal data from within the EU. Authorities will be able to issue fines up to 4% of annual worldwide turnover for non-compliance. 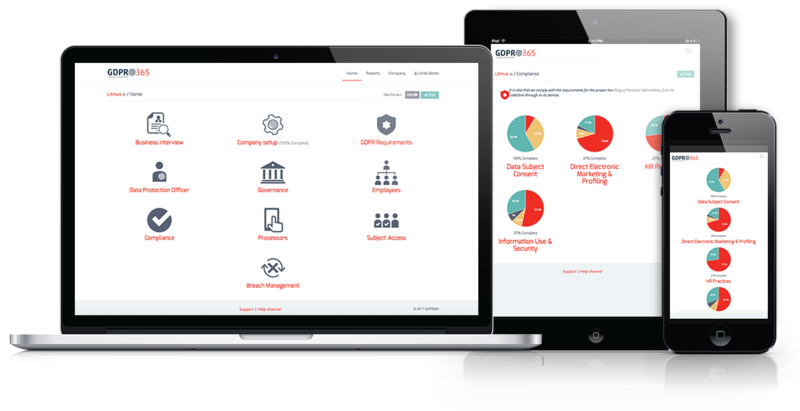 Whether you are a Data Protection Officer (DPO), a consultant or a company needing to become compliant, GDPR365 can provide you with a comprehensive service that simplifies and manages your data protection program. Register now to take the business interview..